B-98FM in Wichita and its sister iHeartRadio stations has posted my interview about the Wichita-Andover tornado. You will find the link to my interview plus the first of my warnings for Andover here. 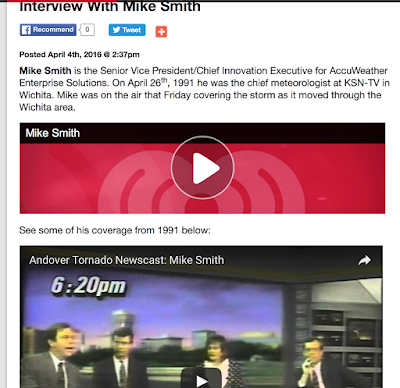 The top link, "Mike Smith," is the interview and the brief excerpt of the storm coverage is below. And yes, it does sound like it was speeded up and it may have been (recording devices have changed a lot in 25 years) but I was also speaking quickly as we had three damaging tornadoes on the ground simultaneously.